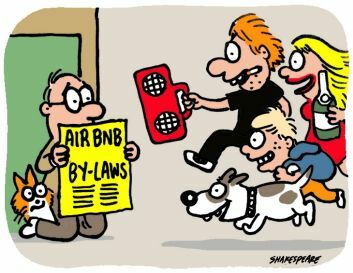 With the state government about to “do an Uber” on short-term and holiday letting, apartment owners need to get their act together if they don’t want to be swamped by frolicking families, bucks night parties and footy fans on a weekend spree. A couple of weeks ago, a NSW Legislative Assembly committee held hearings into legislation governing short-term and holiday letting in NSW. Seeking a legal structure for allowing but controlling short-term letting is a response to its upsurge, led by the monolithic online holiday let agency Airbnb. Make no mistake, this government likes “sharing economy” entities such as Airbnb and Uber, the latter already having been given a free kick to take on the taxi industry. Next up for sharing without caring could be your apartment block where your neighbours may soon find it legal to let out their units for a few days at a time, often for more than they can get from a permanent tenant for a whole week. It’s impossible to predict what specific form the changes will take, but variations on the proposal by City of Sydney Council seem a likely outcome. If I’m reading it correctly, CoS proposes only requiring change of use to holiday lets to be registered as a complying development – with no need for formal approval – while limiting the number of days a year that a property can be let on a short-term basis. However, apartment blocks that didn’t want short-term lets could still ban them through their by-laws. “If made exempt development, an owner’s corporation are not prevented from establishing by laws that could further manage this activity,” say City of Sydney in their submission to the inquiry. That, however, is open to interpretation. The practical reality is that Owners Corps can and do restrict short-term lets, provided the building is already zoned residential. But if you don’t already have a by-law restricting short-term lets, you need to get one in while you can. Most apartments in NSW are owned by investors but, thanks to apathy and proxy farming, a minority of owner-occupiers can pass by-laws without too much trouble. However, if even 25 percent of the owners in your block are attracted by the juicy bait of extra income, they will be able to block new by-laws. That same 75 percent threshold will prevent greedy investors from erasing existing by-laws that get between them and their pot of gold. Whatever changes the government eventually makes, they are unlikely to remove the right of strata owners to create by-laws and run their buildings the way they want. But if you don’t want short-term lets in your building, you need to act now.